DOWNTOWN AS MUCH AS YOU DO. Experience a brand-new way to live and enjoy Colorado Springs. Introducing 333 ECO, located in the heart of Downtown Colorado Springs. Thoughtful and intentionally designed, you’ll discover the best urban living has to offer. Whether its waking up to an abundance of natural daylight, enjoying a swim in the salt-water pool, or socializing with friends as you take in the sun setting behind Pikes Peak, you just might realize this is Colorado Springs living at its best. Apartment living that is amenity-rich, environmentally conscious, and fully embraces an urban live-work-play lifestyle. 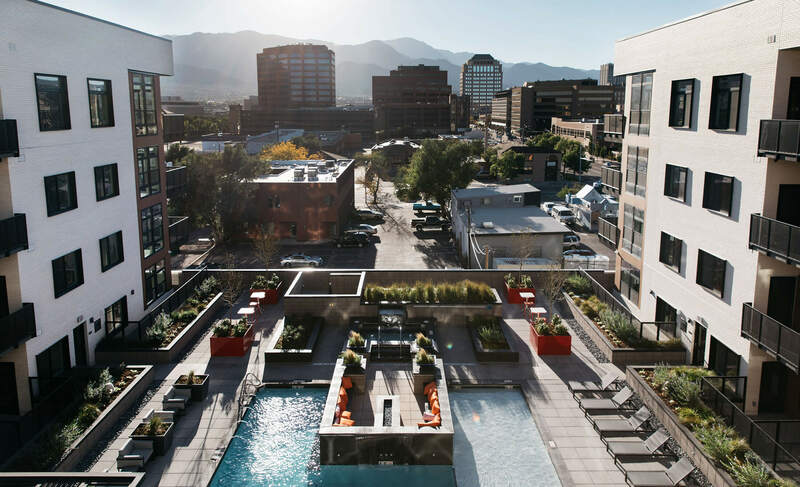 Whether its waking up to an abundance of natural daylight, enjoying a swim in the salt-water pool, or socializing with friends as you take in the sun setting behind Pikes Peak, you just might realize this is Colorado Springs living at its best. Apartment living that is amenity-rich, environmentally conscious, and fully embraces an urban live-work-play lifestyle. Experience our two lounges with panoramic Rocky Mountain views, a lavish year-round pool deck, indoor secure parking, and a pet run just to name a few. Our residents enjoy top-of-the-line amenities that make daily life that much more enjoyable. Downtown Colorado Springs is the heart and soul of the Pikes Peak Region and when you choose to live the urban lifestyle, Downtown becomes your neighbor. Located just steps from ECO, you’ll find many of best restaurants in the City, walking & biking trails, and a host of local shops that make Downtown a unique and vibrant neighborhood. City and Mountain views you can’t find anywhere else. Experience unparalleled views of “America’s Mountain” / Pikes Peak and the Front Range that are beautifully framed by the Downtown skyline. Residents and their guests enjoy the spectacular views from within apartments through oversized Pella windows and from atop the 5th Floor Lounge. Trust us, the view is worth it.